The WDSF will organize an event this year in China, where they will have a mix of invited and qualified dancers. We can see this as a step towards an organized Championship in the breaking scene. Its still developing but they are trying to build for a world championship. Outstanding at this event will be the price money. it is extremely high and I would say at least for bgirls it is historically high. Winning this event will make you the German Champion. Titles like this can help for promotion and since every dancer with a German passport can enter I would say it is definitely a title the winner can claim. Is this the first german breaking championships? This is not the first German Championship, to be honest every year we have plenty. Unfortunately a lot of associations organized their own little Championships. Some of them would only allow you to enter if you are part of this association. So because of this dilemma we had about 4 or 5 German Champions every year, who might have never went to a jam, that takes the value of the title away. In this case some associations collaborate with the organizer (e.g. by paying the flight to China). The organizer is a well-known dancer from Germany and judges/host/dj are all recognized by the German scene. The event is pretty much like any other German 1 on 1, only with two winners who will fly to China and represent Germany. What opportunities does this give to the bgirls? I think this event should be seen as any other high-level competition. The level of bgirls will be high and of course the high price money is also a change. We still have to mention the the price money for the bgirls is not even half of what the bboys will get as a winner (Bboys 20.000$, Bgirls 8000$). Still, a price money in this range will give the winner the chance to rest and concentrate at practice for a few months. It is a step towards having professional athletes. 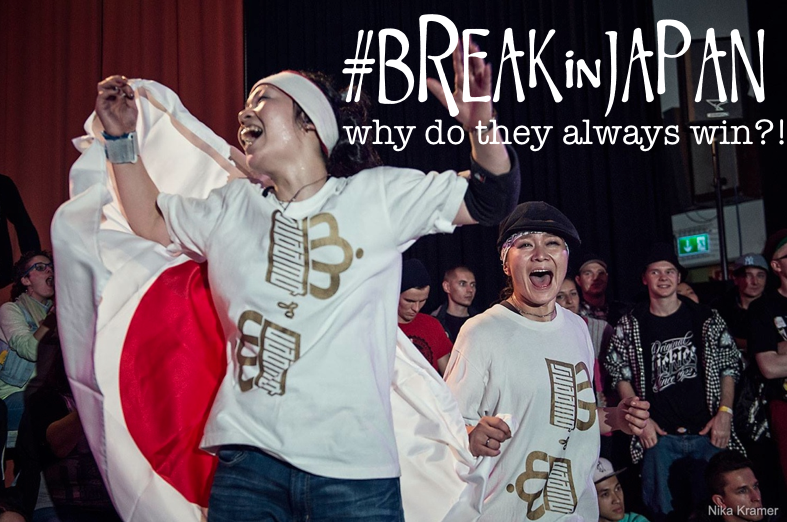 The German Bgirl scene is stronger than it seams! To drop some names: Loopi, Lerok, Frost, Joelle, Naomi, Ladi Dadi, Naccia, Joana… There are more names but these girls definitely are putting in work and represent Germany at international events. The German scene is very divers and the girls concentrate on very different aspects of this dance, that makes the German Bgirl scene very rich. But I also think it is part of our culture to concentrate on education first, so a lot of girls work very hard in universities and combine these two lifestyles. I think if you try to talk about the European scene as a total, then I’m always amazed how many there are! I have the feeling that at every event I go there will be at least one new girl I haven’t seen yet. I think the Eruopean stye is a very divers but solid style. I would say European girls know what they are doing and train very hard. European Bgirls are most time very well rounded and try to cover all aspects of this dance. I definitely think we keep up with the Asian and American scene. What is your future wish for the german breaking scene as a whole? I hope that the German scene will stick more together as one and that we willl hopefully have more financial support from the government or sponsors in general. A lot of german promoters struggle to get the money together to throw an event. The Teamwork started a few years back but I think we can stand together as one even more. The positive side is that we’re already having a healthy competition here and that the communication is working most of the times. We just have to keep up the good work. About you: are you going to China? What does this mean to you? How will you prepare? If everything goes right with my Visa then I will be in China. I am very excited since it looks like a new opportunity. It is supposed to be a preparation for the olympics, which was always a personal goal for me since I did Gymnastics. Getting flown to China means a lot to me, i often struggle to see myself at this stage but I’m trying to forget that when I battle and tell myself that I belong exactly where I am. I will definitely prepare myself. I am not sure if I want to prepare rounds or go as i did in the past (freestyling with my blocks). I changed my diet a few months ago, which is working for me already and I’m trying to implement more of my moves that I’m yet scared to do. I’m doing a lot of workout and I hope it will prevent me from injuries. For the practice sessions I have my training partner NoIndex who will battle me and give me the motivation to throw hard even at practice. My main problem will probably be to stay calm since I am super excited and tend to rush through my dance. Facing this problem will be my main focus.